There are many types of non-cancerous growths in the mouth, which occur in people of all ages. Growths may be in the form of a fluid filled cysts, excess bone growths, fibrosis tissues or lumps. They may be caused by different reasons such as irritation, an overgrowth of bone or infection. Some non-cancerous growths may not cause any problems, however, depending on the size and location, certain growths may cause pain or interfere with eating. Common growths in the mouth include canker sores and fever blisters. Other types of non-cancerous mouth growths include benign tumors such as a fibromas. 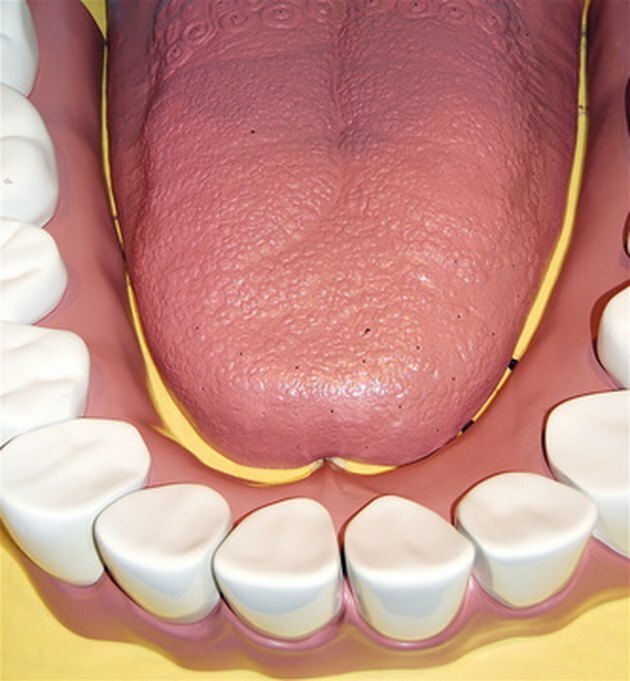 Mucoceles, torus palatinus and candidiasis, also referred to as oral thrush, are other non-cancerous mouth growths. There are different causes of non-cancerous growths in the mouth. Some growths such as fever blisters, are caused by the herpes simplex virus. An overgrowth of yeast in the mouth, candidiasis, causes non-cancerous growths called thrush. Other sores are caused by trauma to the area of the mouth. Fibromas and mucoceles are often caused by biting the inside of the cheek or lip. Cancer sores may also be caused by irritation. Other growths such as torus palatinus don’t have a known cause. Not all non-cancerous growths in the mouth require treatment. If the growth is painful or interferes with eating, treatment may be recommended. Treatment depends on the type of growth. Canker sores and fever blisters will usually resolve on their own. A topical ointment may be used to relieve pain. Fibromas and mucoceles may be surgically removed. Torus palatinus will not usually require treatment. Even after treatment, it is possible the growth can reappear. This is especially true if the growth was first caused by an irritation. According to the Merck Manual, up to 40 percent of people who have a non-cancerous growth on the gum removed will have the growth come back due to the remaining irritation. The Oral Cancer Foundation recommends seeing a dentist for any mouth growth that does not heal within two weeks. Although the growth may be nothing serious, it is important to be sure the growth is non-cancerous. In addition, some non-cancerous growths such as leukoplakia can develop into cancer in time and may need to be removed. The dentist will perform an exam and take a history to help identify the growth. A piece of the growth may be removed and sent to a lab for examination for diagnosis.